Our two, 25 yard ranges are safe, well-lit and climate controlled. Our design includes a ballistic envelope with impenetrable walls, floors and ceiling, air cleaning circulation system, lighting to approximate day light, sufficient space for safe firing, and acoustical treatment for sound attenuation and reverberation. Want to avoid the possibility of a wait time? Make a lane reservation and we will have a lane waiting for you! Shooting lanes will accommodate firearms up to a .308 rifle, .44 magnum handgun, and 10 gauge shotgun. 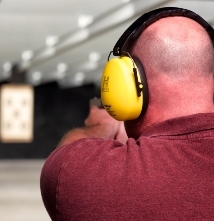 Each shooting range has electronically controlled target system allowing the shooter to control his/her target distance from the firing line out to 25 yards. Lane Rental includes eye, over-the-ear protection and 3 targets.